Kobelco appoints Hasel İstif Makineleri A.Ş. 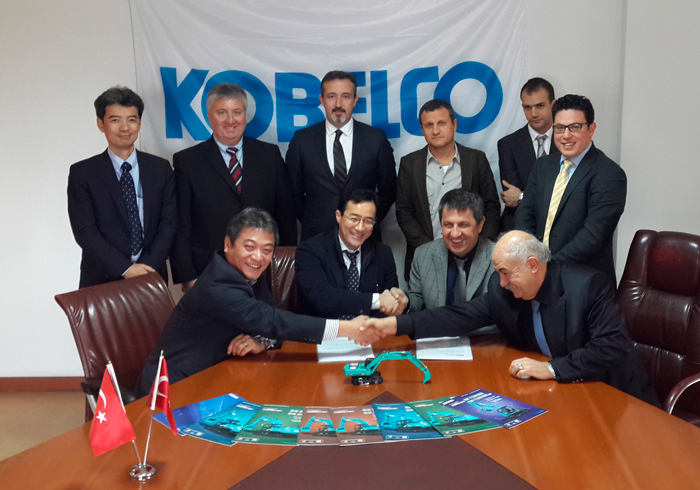 as dealer in Turkey - Kobelco Construction Machinery Europe B.V.
ALMERE, January 20, 2014 – Kobelco Construction Machinery Europe B.V. and Hasel İstif Makineleri A.Ş. have signed an official dealership agreement. Hasel will be responsible for the sales and service of Kobelco excavators throughout Turkey. Hasel has an excellent reputation and is well known in Turkey for their high-quality products, and most importantly for their professional after-market and service capabilities. The company is based in Istanbul but also has several branches and service / parts facilities throughout Turkey. Hasel will attend the Ankomak exhibition which will take place in Istanbul from 21-25 May. This will be the first occasion where people can experience the comeback of Kobelco excavators in Turkey.